Haybarn Holiday Cottage is a beautiful barn conversion that has been recently converted. 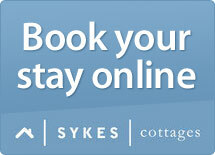 A modern accommodation with plenty of home comforts for you to enjoy your stay in North Yorkshire. Both Haybarn Holiday Cottage and Stable Holiday Cottage have been finished to a high standard, located to the stables of the country farm based on the outskirts of our holiday park. The farm has plenty of animals for you to meet, including horses, ponies, goats, sheep and pigs. Haybarn Holiday Cottage is located on Goodenbergh Country Holiday Home Park, which is bordering the Yorkshire Dales and Forest of Bowland with The Lake District a short drive away. We are proud of the peaceful and relaxing area that is surrounded by woodland walks and the many birds, flora and fauna that can be found on our doorstep.